I drink a lot of Malbec. No question there. And well, here's another one. This is the 2010 Colores Del Sol Malbec from the Mendoza Region of Argentina, just like many Malbecs. I'm starting to wonder how big the Mendoza Region of Argentina really is, because there are a TON of wines all produced in that same region. Perhaps it's like California where many vineyards are packed into the same area. I'm not sure. Maybe I'll look it up sometime, but today I'm too lazy. Let's get to the wine. 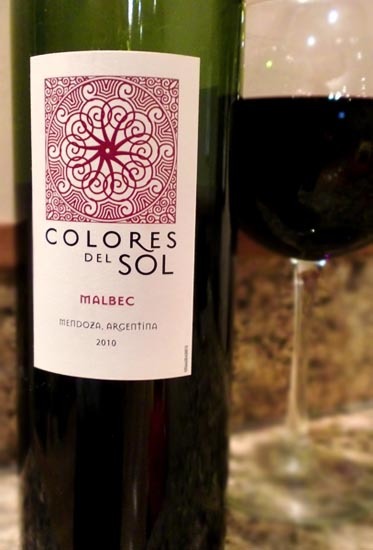 The 2010 Colores Del Sol Malbec pours an inky deep purple and has aromas of dark blackberries and black cherries. Tasting brings a good bit of raspberry, dried cherries, a hint of something floral and a touch of leather and oak. Tannins are mild, but the mouthfeel here is quite velvety, which I love. This is an interesting Malbec. It retains the characteristic rustic nature of Malbec while at the same time being a bit more elegant and refined. It's almost a hybrid between the Argentinian and French wine styles. And at around $12, it's a good verging on great deal. Drink This: if you want an affordable Malbec that is more refined than the usual at this price range. Don't Drink This: if you are looking for a burly, rugged Malbec. Having some glasses of this wine in the US right now and it's so good that I had to Google it!